It seems like everytime I turn around, Lil Wayne is perpetrating some new kind of ignorant sh-t. And God bless him for it. Luckily for hoops fans, the NBA is prime territory for Weezy’s ridiculousness to shine, and this season has been no exception. Not only was the Artist Formerly Known as Dwayne Carter allegedly asked to leave a Miami Heat game for harassing the players, he went on stage in Houston during All-Star Weekend and claimed to have “f-cked Chris Bosh’s wife.” Stay classy, Young Tunechi. Good game, better block: LA Clippers’ forward Caron Butler swats Serge Ibaka’s shot directly into the face of a referee, who promptly collapses to the floor. The best part? The ref makes the “out-of-bounds” call as if nothing happened. Homeboy definitely earned his paycheck. 3. 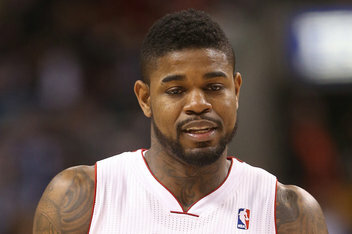 Amir Johnson Just Won&apos;t Let Go, Dammit! Toronto Raptors’ forward Amir Johnson and his somewhat Mr. T-esque haircut have stepped up their game lately, but before moving into the starting lineup he was better known for this hilariously childish incident. After a free-throw, Johnson tries taking the ball from a referee, and refuses to let go when the ref tells him to. When the ref ejects Johnson from the game, the Raptor approaches the official in a threatening manner, then throws his mouthpiece at the him before finally leaving. Sometimes it’s better to just let it go. The free-throw line is a hotbed for strange behavior, and referee Courtney Kirkland’s block on Kris Humphries is no exception. You really just have to watch this one. The most notorious trash talk incident of the season so far, Kevin Garnett’s claim that Carmelo Anthony’s wife La-La “tastes like Honey Nut Cheerios” made headlines and almost led to a post-game altercation. The best part is, this is far from the wrongest thing KG’s said to another player: in 2010, he allegedly called Charlie Villanueva, the alopecia-stricken Pistons forward, a “cancer patient.” Cold-blooded. 6. The Biggest Trade Deadline Move Was ... JJ Redick to the Bucks? I don’t care, so you probably don’t either, but the Orlando Magic just traded 3-point specialist JJ Redick to the Milwaukee Bucks. This was the biggest move made at a trade deadline that featured such big names as Josh Smith and Dwight Howard. Do better, NBA. If it doesn’t already exist, there should definitely be a blog called “Dumb Sh-t Rappers Do at NBA Games.” When announcer Matt Devlin dismissed Wale as “not Drake” at a Raptors-Wizards game this month, the rapper cooked up some Twitter beef that culminated in him walking up to the announcers booth and confronting Devlin. You’re working too hard here, Wale, it’s not that serious. But thank you for entertaining us.